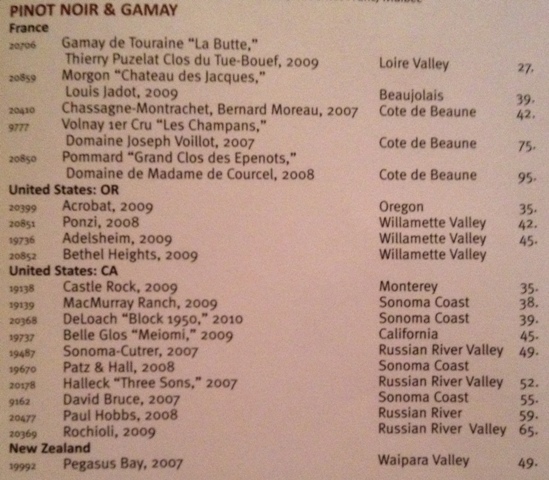 Quick: Look at the Pinot Noir section of this wine list and find the domestic values. It's not that easy, is it? Unless you really know what you're looking for and have quick familiarity with the street prices of the wines on the list you'll probably do what I do: Have a quick look at prices of the less expensive bottles and bail because the markup is 3 times retail or more. 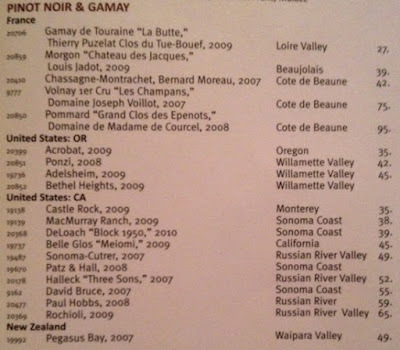 Let's focus on the California Pinot Noir section of this list. Castle Rock is readily available at retail for $9.99. At $35 that's a 3.5X markup. The Belle Glos Meiomi is a favorite but I have a hard time paying $45 for a wine I see for $16.99 all over town. However, notice what happens as you push further down the list. The 2008 Paul Hobbs Russian River Valley Pinot Noir at $59 is actually a very good price for an outstanding wine that's been hard to find at retail ever since it landed in Wine Spectator's Top 10 list last year. And the 2009 Rochioli Russian River Valley Pinot Noir is an absolute steal at $65. I've been looking for Rochioli all over town - and all over the Internet - for months and was thrilled when I found it for $60. A $5 markup over street price in a restaurant for a wine I've been really looking forward to trying? Amazing. I was going to knock out a quick post saying "Hey! 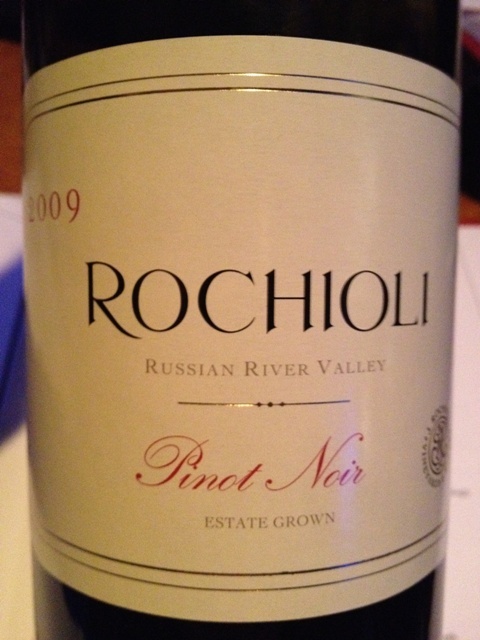 I found a great deal on Rochioli Pinot at Legal Sea Foods in Burlington, MA". But I thought this would be a good time to share some tips on how I determine whether wines are a good deal with a particular focus on navigating restaurant wine lists. I don't like spending a long time agonizing over whether I'm buying the best value on the wine list. It's rude to disappear mentally from the table just when everyone is getting settled in. And it's no fun. I like to focus on one category that's likely to pair favorably with the general style of cuisine at the restaurant, give the list a look and quickly decide whether to go by the glass or by the bottle. Probably the most uncomfortable thing, especially when you're picking the wine but not picking up the bill, is determining how much is too much. The best way to stay out of trouble is to avoid pricey categories. Unless you're determined to impress someone with a wine from a big-name producer or elite region seek out the more affordable categories. If you're ordering wine for a mixed group, I'd avoid trying to impress with your knowledge of obscure grapes. Never underestimate how much people like great tasting luscious wines that pair well with food. Unless you really have an angle on a crossover wine that's crowd friendly and a little off the beaten path, stay with food-friendly classics like Pinot Noir, Merlot, Cabernet Sauvignon, Riesling, and Sauvignon Blanc - depending on the style of cuisine at the restaurant of course. Take Napa Cab producers like Buehler, Honig, and Chappellet. A lot fewer people have heard of them than say Sterling, Mondavi, and Caymus. These lesser known producers tend to put out an excellent product at their price points and since their names aren't as recognizable they can sometimes be had at lower markups than their more famous peers. I think most of the time, when servers are asked for a recommendation off the wine list, the question is framed in terms of "what's good? ", what would go well with a certain dish, or a general request to help find a wine that's aligned with the style of wine one prefers. If you know the category of wine you're interested in try asking: "What are some of your best values on domestic Pinot Noir by the bottle?" Answering this question effectively requires a familiarity with street/purchase pricing that your server may not be familiar with. If they seem in doubt and offer up a visit from a person more familiar with their purchasing decisions take them up on the offer. It may seem counter-intuitive to ask to see a list of the expensive stuff when you're looking for value but in my experience this is where the better values often hide. Like retailers, restaurants are often offered closeout pricing on back vintages. Similarly if they have an extensive wine program may be looking to clear inventory. Not recommended: Trying to play let's make a deal. Unless your server/wine steward/sommelier/GM offers up a treasure that's not on the menu I'd consider it poor form to try to haggle. Wine Spectator is a great way to improve your familiarity with top producers. One thing I like about Spectator is that they list the winery-provided production level and release prices for each wine they review. I use this as a starting point when filtering for value. If the production levels are too low (say less than 300 cases) it's unlikely the wine will be available without a lot of work. When production levels get higher (say over 5,000) it's more likely the wine will be across the country. CellarTracker is most famous for its crowd-sourced wine reviews and cellar record keeping capabilities, but two of its most underrated features are how it lists Community Average Values and the Top Stores selling each specific wine. When users enter a wine into CellarTracker they can optionally indicate how much they paid for a wine -and- where they bought it. I look at the Community Average Value when seeking to determine whether a specific wine regularly sells for less than its release price. Take for example the 2008 Sette Ponti Toscana Oreno. Wine Spectator lists the release price for Oreno as $110. However, the CellarTracker Community Average is just $59.61 which gives me a sense that the wine is frequently sold at deep discount. The Top Stores feature can be helpful in finding retailers that offer a wine, but inventory changes frequently so it's not necessarily an efficient way of tracking down a specific wine at retail (more on that in a moment). I find Top Stores most useful in getting a feel for whether a wine is sold predominantly via mailing list directly from the winery -or- is likely to be available at retail. Take for example the 2009 Rochioli Pinot Noir. 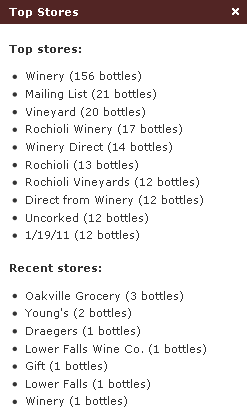 The Top Stores on CellarTracker makes it clear Rochioli sells most of their wine directly to consumers via mailing list. On CellarTracker if you click "$ Where to Buy" it takes you to Wine-Searcher.com. 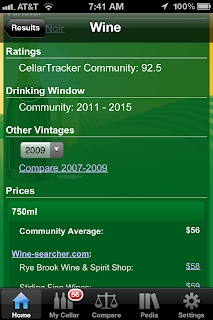 CellarTracker pre-populates the search with the wine and vintage you're interested in. Wine-Searcher.com is the leading site for finding wine availability from retailers and wineries. Since wine isn't sold on Amazon.com, and shopping sites you might use to find other consumer goods aren't tailored to the complexities of wine (bottle size, vintage, confusingly similar bottlings from the same producer, etc) Wine-Searcher can be an excellent resource. If the wine has a barcode Corkz can scan it and if it is unique to the wine (which can be problematic) it can take you directly to a list of matching wines. Pretty handy. Although I hope these tips are helpful, I can't say that I consider myself an expert wine list navigator. There are just too many categories out there I'm not familiar with and I'm sure I'm overlooking some great deals because I'm just not aware of the producers. That said, some restaurants don't give us much of a fighting chance with massive markups across the board. Kudos to Legal Sea Foods for offering some fantastic wines at fair prices. Their VP of Beverage Operations Sandy Block does an amazing job finding flavorful delicious wines that pair well with the food they serve. The '09 Rochioli Pinot Noir lived up to my high hopes. A classic flavorful California Pinot Noir that paired brilliantly with a variety of dishes. It was a treat to find, especially at a reasonable price. But what was as interesting as the wine was seeing the variable markup levels depending on the price of the wines on the list. I'll take a closer look at wine lists in the future - I don't know that I've seen this trend so strikingly elsewhere. Question of the Day: What tips would you share for navigating restaurant wine lists more effectively? I'd love it if you subscribed to The Wellesley Wine Press so we can keep in touch.